Whistling Straits golf club digital picture of the 11th hole of the Straits golf course. 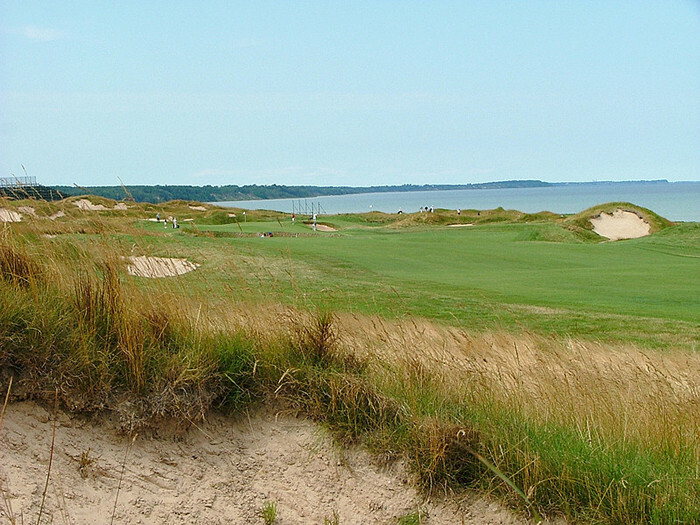 'Sand Box' -Here's a view from the left of a sand dune looking up the fairway and into the green of the 618 yard par five 11th hole at the Whistling Straits golf club as set up for the 2010 PGA Championship. You must negotiate 'winnowy dunes' and bunkers down both sides of the fairway to leave a clear third shot into this 'Surreal Scottish-looking' golf hole..